"Gabbi has had no health problems. She is now 7 years old. She is still very active and loves spending and going on outings with her family. She is very protective of her family but just barks a lot when she does not like someone. She is leashed trained. She responds to verbal commands. This mix breed is very intelligent. She gets along with other animals." The Scorkie is not a purebred dog. 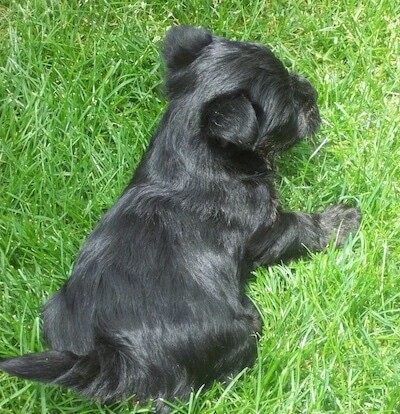 It is a cross between the Scottie and the Yorkie. The best way to determine the temperament of a mixed breed is to look up all breeds in the cross and know you can get any combination of any of the characteristics found in either breed. Not all of these designer hybrid dogs being bred are 50% purebred to 50% purebred. It is very common for breeders to breed multi-generation crosses. 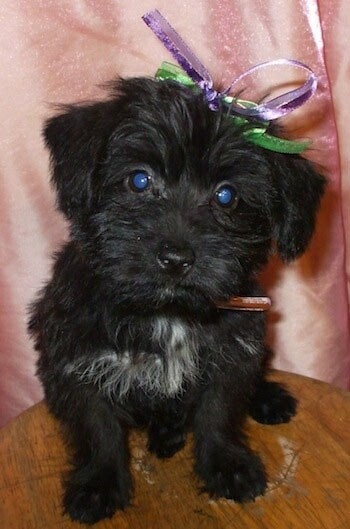 Gabbi the Scorkie puppy at 10 weeks old—"Gabbi is a very loving Scottie / Yorkie mix. She loves to cuddle and play with my three children. She loves to go bye-byes with her family. She weighed 4 pounds at 14 weeks old." Gabbi the Scorkie at 7 years old old with her Yorkie friend. 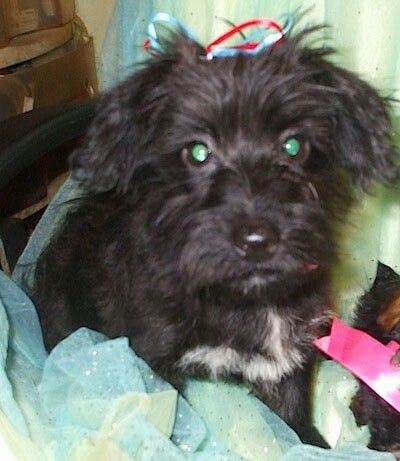 Gabbi the Scorkie puppy at 5 months old—"Gabbi is a Yorkie / Scottie mix. She is very loyal and loving to her family. She loves to play mommy with our younger Yorkie. She loves to be held and cuddles a lot. She loves to go bye-byes. 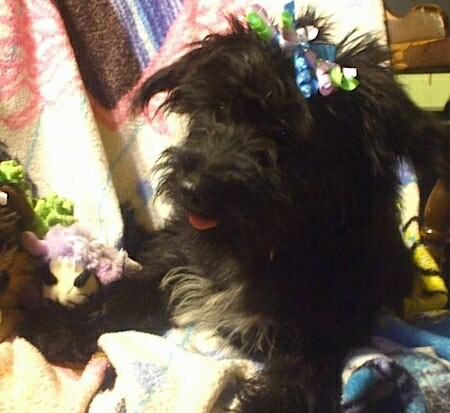 Milo the Scottie / Yorkie mix breed dog (Scorkie)—"This is Milo, my 8-month-old Scorkie weighing 10 pounds. 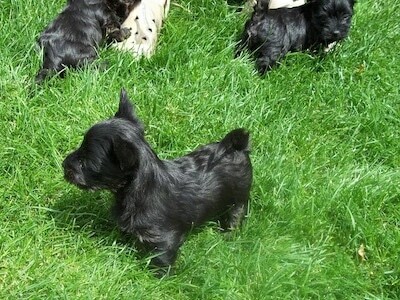 He has a very Scottie personality. He is one of the happiest and friendliest dogs I've ever seen." A litter of Scorkie puppies at 4 weeks old— "These are some pictures of our Scorkie litter. They come from 2 great bloodlines! They are great family pets, and great with kids. They are smart, loving and loyal. They love to cuddle. They are fun and playful, and just the right size! Won't get more than 10-15 lbs." 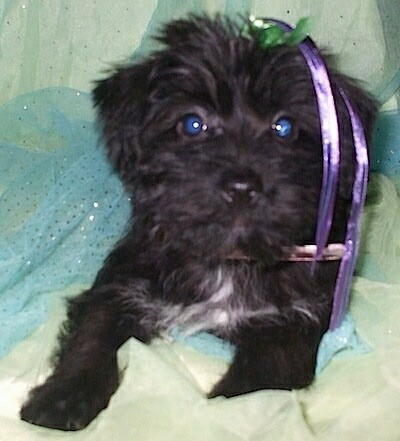 Milo the Scottie / Yorkie mix breed (Scorkie)—"Milo is so smart! He knows all basic commands (sit, lie down, shake, beg, come, stay), and in addition to this, he's learned how to "stand" while sitting on his bottom." 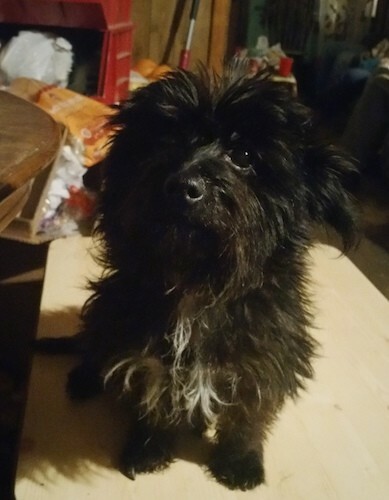 Milo the Scottie / Yorkie mix breed (Scorkie)—"As each month passes, he starts to take on the more Scottie look, but when I look at his face, I think he just looks like a black Yorkie. Besides the potty training, he has been the easiest little guy to live with! We don't know how we got along so long without him!" Milo the Scottie / Yorkie mix breed (Scorkie)—"He loves to be held like a baby on his back, and he falls asleep if you scratch around his ears."